A series of three large earthquakes have again rattled Christchurch this afternoon, New Zealand time. According to the United States Geological Service USGS, a magnitude 5.8 quake hit at 1.58pm local time, followed by a 5.3 at 2.06pm, and another 5.8 at 3.18pm. There have been reports of liquefaction in some areas, and power out and phone lines down in much of the city. Rockfalls have been reported in the Sumner area of the city, where they occurred in earlier earthquakes. People have been urged to stay away from hill suburbs in the city, because of the risk of further aftershocks and rockfalls. Major holes in roads were reported to have opened up in some places, with liquefaction reported in Avonside. Congestion built up on roads and drivers wer cautioned to exercise extreme care, and to stay of the roads if at all possible. Christchurch airport and city shopping malls were evacuated after the first quake struck. There was no tsunami alert issued by the Pacific Warning Center. People were being urged to use text instead of voice calls on mobile phones to check on friends and relatives, as the phone lines still in operation were increasingly jammed. Mayor Bob Parker, who was holidaying in Taupo in the North Island, has booked to fly back to the city, and has said his heart breaks for people in the region impacted by these further serious quakes. Indeed, our hearts go out to all those impacted by these latest quakes in the Christchurch area. People must be asking: just how long can these continued seismic events go on for? I’m sure people were looking forward to a quake-free summer holiday period. 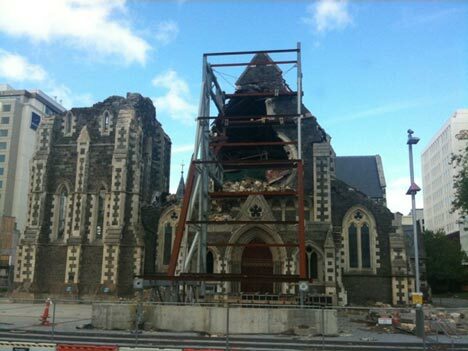 Image by John Johnston: Christchurch Cathedral in November 2011, before these latest quakes. Previous post: Is The Fukushima Nuclear Plant Really In A State Of ‘Cold Shutdown’?